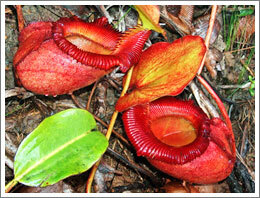 This flora and fauna botanical paradise covers an area of 754 square kilometers. The biggest attraction in Kinabalu Park would be the Mount Kinabalu Botanical Garden and one of the world's most prominent mountains, Mount Kinabalu, which peaks at 12,455 feet above sea level. 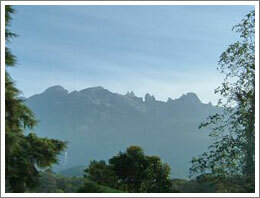 Kinabalu Park is open daily from 7am to 5pm. 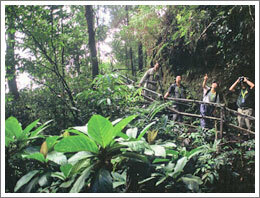 The Kinabalu Park entrance is very easy to reach from Kota Kinabalu. Buses leave every morning - just ask your hostel/hotel or around the bus station (Kota Kinabalu North Bus Terminal in Inanam, 10km to the northeast of the city centre.) Buses going to Ranau, Sandakan or Tawau will pass by the park entrance. It's best to leave before eight - if you're lucky you'll catch a beautiful clear view of the mountain outside the left-hand side of the bus as you approach the park. The journey should take 1-2 hours and should cost between RM10-RM15. You can also catch buses from Sandakan (a six hour journey). An alternative is to take a long-distance shared taxi at Taxi station near Jalan Padang. 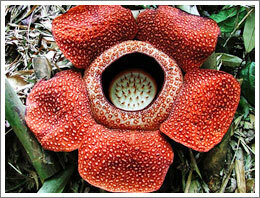 A ride between Kota Kinabalu and the park should cost RM15-RM18 each way. Taxis will only depart once they are full, though, which usually means they have seven passengers(Toyota Unser), so you may have to wait a while. Alternatively you can pay for the missing passengers and leave immediately. Regular (i.e. non-shared) taxis in Kota Kinabalu try to offer their services for RM150-200 or more for one-day drives to the park and back. Given the ease with which one can travel by public bus or shared taxi, however, this is an unneccessary option for budget travelers. Self-drive is another option with car hire readily available at Kota Kinabalu airport. Driving is an easy option for those accustomed to driving on the left hand side and gives the option to stop at things en route. Car hire rates are negotiable so compare rates on offer from the various companies. Non-Malaysians pay RM15 (adults) / RM10 (children) to enter the park. (Malaysians pay RM3 and RM1 respectively). There is another RM120 fee (plus RM7 for insurance) to climb the mountain in addition to park entry. Alternatively, you can climb from Mesilau Nature Resort. The trail is 2 km longer than the one that begins from the park entrance but is less steep overall.